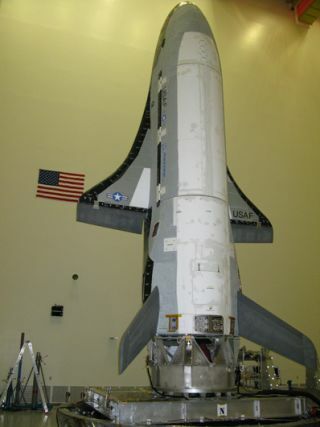 The X-37B/OTV spacecraft undergoes final testing at Boeing for a 2010 test flight. Click to enlarge. A secretive military spacecraft resembling a small spaceshuttle orbiter isundergoing final processing in Florida for launch on April 19. The Air Force confirmed the critical preflightmilestone in a response to written questions on Thursday. The 29-foot-long, 15-foot-wide OrbitalTest Vehicle arrived in Cape Canaveral, Fla., last month according to theAir Force. The OTV spaceplane was built at a Boeing Phantom Works facility inSouthern California. Managed by the Air Force Rapid Capabilities Office, the OTVprogram is shrouded in secrecy, but military officials occasionally releaseinformation on the the spaceplane's progress. "It is now undergoing spacecraft processing includingcheckout, fueling, and encapsulating in the 5-meter fairing of the Atlas 5[rocket]," an Air Force spokesperson said. The 11,000-pound vehicle will launchinside the nose cone of the Atlas 5 rocket. Liftoff is currently set for 10p.m. EDT on April 19. The reusable spacecraft is more famously known as the X-37B. Thedesign is based on the orbital and re-entry demonstrator initially developed byNASA, then handed over to the Pentagon. The NASA version of the X-37 featured an equipment bay 7feet long and 4 feet in diameter for experiments and deployable payloads. The Defense Advanced Research Projects Agency completed aseries of approach and landing tests in 2007 using the White Knight airplanefrom Scaled Composites as a mothership. It is easy to track the X-37's tumultuous history. NASAawarded the first X-37 contract to Boeing in July 1999, and the agency flew aseries of visible atmopsheric tests on a scale model of the spaceplane in 2001.The X-37 began its transformation from a human spaceflight testbed to amilitary-run project when NASA shifted responsibility to DARPA in September2004, a consequence of the space agency's new focus on lunar exploration. But specific payloads for the Air Force's OTV program aren'tso clear. Officials have denied interview requests on the project, and themilitary only releases information through written responses. The X-37B's mission is to "demonstrate a reliable,reusable, unmanned space test platform for the United States Air Force,"the military fact sheet says. "Objectives of the OTV program include spaceexperimentation, risk reduction and concept of operations development forreusable space vehicle technologies." At the end of its mission, the X-37B will fire its engineand drop from orbit, autonomously navigating through a fiery re-entry on theway to its 15,000-foot-long primary runway at Vandenberg Air Force Base, Calif.Edwards Air Force Base is the backup landing site. The duration of the spaceplane's first mission isn't beingannounced. "The X-37B has the requirement to be on-orbit up to 270days," the Air Force spokesperson said. "Actual length for the firstmission will depend on the meeting the mission objectives, which consists ofcheckout and performance characteristics of the spacecraft systems."